Samsung has recently revealed its second generation of Galaxy A series smartphones, named as: Galaxy A3(2016), Galaxy A5(2016) and Galaxy A7(2016). While Samsung Galaxy A3(2016) is yet to launch officially, other two smartphones Galaxy A5(2016) and Galaxy A7(2016) is already listed in samsung's official website in china. These two mobiles are already available for sale pricing at Rs.25,000 and Rs.28,000 respectively according to indian rupee. Both Galaxy A5(2016) and Galaxy A7(2016) holds most of their specifications very similar with minor changes, here comes their unique features accordingly. Samsung Galaxy A5(2016) sports 5.2-inch super Amoled HD display with 2GB of RAM and 16GB internal storage which can be expanded upto 128GB. It is powered by 1.6GHz octa-core processor and 2900mAh non removable battery. 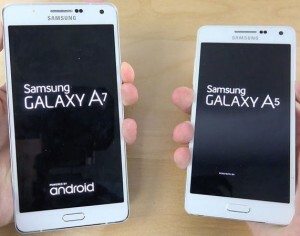 Samsung Galaxy A7(2016), a single SIM smartphone comes with 5.5-inch display touchscreen and 3GB of RAM. It supports internal storage of 16 GB which is expandable upto 128GB and 3300mAh non removable battery. Other similar specifications both Galaxy A5(2016) and Galaxy A7(2016) holds include: 13 MP of primary camera and 5MP of front selfie shooter with f/1.9 aperture lenses, Android 5.1 OS and other connectivity options such as Wi-Fi, GPS, Bluetooth, 4G. These smartphones are expected to be launched sooner in India.